Scientists working on a paper that mentions the causal agent of black leaf streak (also known as black Sigatoka) are advised to check their manuscript. If they are still using the name Mycosphaerella fijiensis, they need to replace it with Pseudocercospora fijiensis. 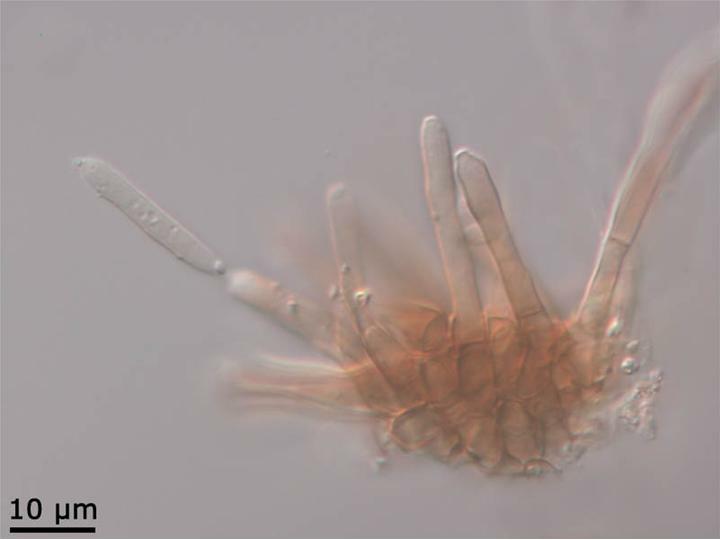 Those familiar with the pathogen will recognize the new name as the name of its asexual form (M. fijiensis was the name of its sexual form). What changed is that the nomenclature system has finally caught up with biology and no longer allows the coexistence of separate names for the sexual and asexual forms. Like many of the fungi that cause disease in plants, the causal agent of black leaf streak is a pleomorphic fungus, meaning that it occurs in various distinct forms. In this case, the fungus has both a sexual state (teleomorph) and an asexual one (anamorph). The practice of giving separate names to the different forms of pleomorphic fungi has been debated since the middle of the 19th century. At one point, the rules became so complex that, depending on the mycologists, they were interpreted differently. Changes to simplify and clarify the procedure were introduced in 1981. But because the rules did not allow taxonomists to recycle names, many plant pathologists continued to use the old names instead of adopting the new ones being proposed. The 1981 provisions also failed to foresee the impact of molecular tools on exposing the shortcomings of a taxonomy based only on morphological traits. For example, probing the evolutionary record contained in DNA revealed that the genus Mycosphaerella comprised fungi that, even though they shared similar morphological characters, were in fact unrelated. A 2009 study argued that the genus Mycosphaerella should be limited to fungi with Ramularia anamorphs. The turning point was the 2011 Amsterdam Declaration on Fungal Nomenclature, which made the case for an orderly transition to a single-name nomenclature system. Soon after, the one fungus, one name principle was enshrined in the International Code of Nomenclature for algae, fungi, and plants (Melbourne code), named after the Australian city where it was adopted. One consequence of the unravelling of the Mycosphaerella genus is that Pseudocercospora is now recognized as a genus in its own right. In addition to P. fijiensis, the genus also includes the other primary causal agents in the so-called Sigatoka disease complex (see box of same name). These species changed genus because they have Mycosphaerella-like teleomorphs. The Mycosphaerella genus is now restricted to species that have real Mycosphaerella teleomorphs and its name will be changed to Ramularia. But old habits die hard. So far, only a few banana scientists have adopted the new names. A search of Musalit—a repository of references on bananas—brought up only 8 papers in which the authors had put Pseudocercospora as the generic name of the causal agent (5 in 2017, 2 in 2016 and 1 in 2014). During the same period, 65 papers had Mycosphaerella. As the authors of a 2015 review on naming plant-pathogenic fungi point out, “plant pathologists and other users of fungal names are understandably often irritated and frustrated by name changes that can appear nonsensical”. But they should welcome changes that “reflect a more logical understanding of relationships, arising from new research with molecular tools and… are more predictive of the biology and ecology of the fungi concerned”. The merging of sexual and asexual generic and species names is processed by working groups under the aegis of the International Commission on the Taxonomy of Fungi. Crous, P.W. et al. 2016. Global food and fibre security threatened by current inefficiencies in fungal identification. Phil. Trans. R. Soc. B 371: 20160024. Rossman, A.Y. 2014. Lessons learned from moving to one scientific name for fungi. IMA Fungus 5(1), 81–89. Wingfield, M.J. et al. 2012. One fungus, one name promotes progressive plant pathology. Molecular Plant Pathology 13(6), 604-613.